The constant question that I get from people is “What do you use on your skin?”. Aside from saying SUNSCREEN, I also tell them that I use the three products from the Re-Everything Line of VMV Hypoallergenics. I might have mentioned these products on my YouTube video entitled “My Favorite Skin Care Products“. If you are interested to know what they are, do click on the title to be brought to my blog page to see the video. I decided to do a short “application” video yesterday and uploaded it to my Instagram page. These three products are the core of my skin care routine and I cannot live without them. And I have been using them ever since BEFORE I became Brand Ambassador for VMV Hypoallergenics 3 years ago. The video was uploaded to my Instagram page (click to see the original Instagram post) and is divided into three one-minute video segments. As of March 25, 2018, I uploaded the video on my YouTube channel so that a viewer can have a much more pleasant experience watching the video with out cuts. Kinetin, a growth hormone from plants that promotes cell division. Unbuffered glycolic acid to help renew the skin. Potent anti-oxidants such as green tea and rice phytic acid that protects your skin from damage/discoloration. The Re-Everything Eye Serum has an added ingredient called Hexapeptide which is known for its water-binding properties and skin-restoring abilities. The Re-Everything Cream (Advanced) has coconut oil in it. Aside from acting as it’s moisturizing agent, it is also known for its anti-bacterial and ant-inflammatory qualities. Do take note that The Re-Everything Cream comes in a “Primary’ treatment. You are supposed to start with that before using the advance treatment so your skin can learn to adapt and adjust to VMV’s formula. It’s always best to start slow and steady. 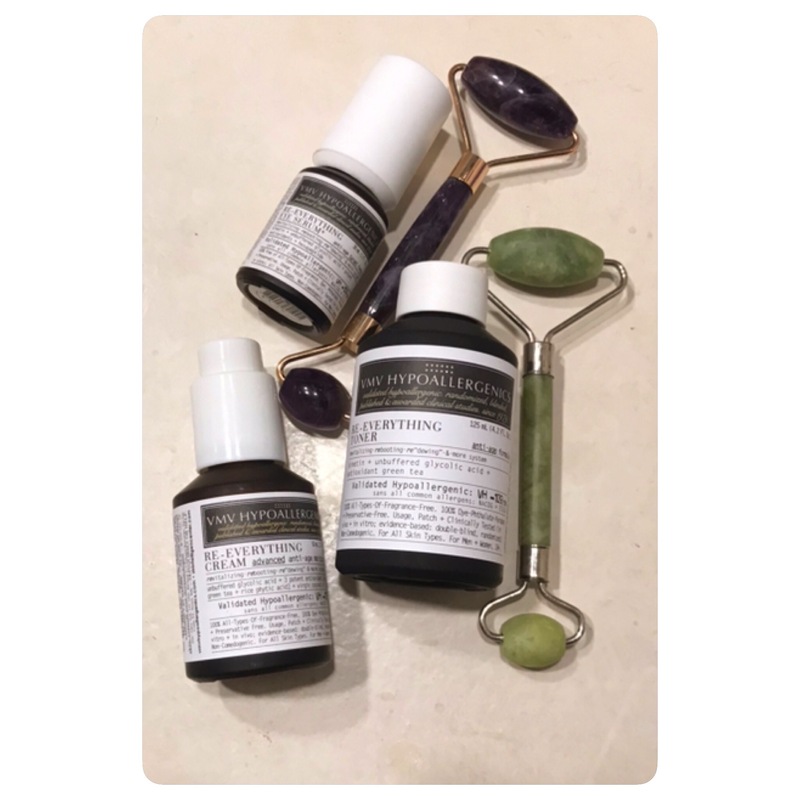 I actually do a simple facial massage after I apply these products on my face. I use smooth circular motions and upward hand movements. This removes puffiness, aids in lymphatic drainage and helps promote blood circulation on the face. The facial stone rollers you see here are a latest addition to my routine. I am not well versed in the healing properties of stones BUT I do know that Jade is used for its healing properties while Amethyst is known for its relaxation properties. So when I am stressed and certain parts of my face start to “twitch”, I use the Jade roller to massage the area of the twitch and it’s gone. I use the Amethyst roller on a daily basis to relax. I do have a faint idea that certain crystals generate electrical current when wet or when “rubbed”, I’m sure not strong enough to light a light bulb BUT it might be minute enough to create a stimulating effect on our skin. I might be wrong with this hunch of mine, so please let me know your thoughts about this. I purchased my Jade Roller from a bazaar, unfortunately I have no contact with them. The Amethyst roller, I purchased from Jean Dragon . Click on her name to be brought to her Instagram page.